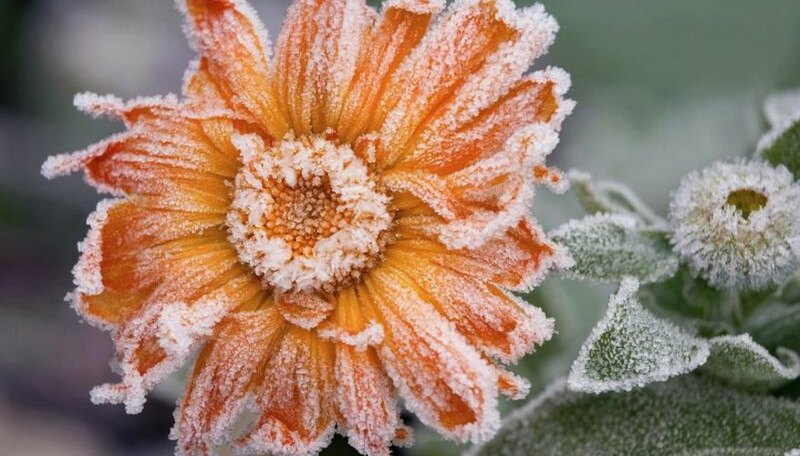 Every so often, your area may experience a cold snap with lower-than-normal temperatures that put less cold-hardy plants or tender new growth at risk from freezing or below-freezing temperatures. Several strategies help minimize damage, among them applying a thick layer of mulch, covering plants or using a heat source. Applying water, either to the soil or the plants themselves, is another tool to help plants survive the cold. Cold moves through dry air and soil faster than it does in moist soil and air. Watering prevents the cold from moving in and wet soils hold four times more heat than dry soils. Wet soils conduct heat from inside the earth to the soil surface better than dry soils, with the heat radiating to the air above the soil. Sprinkling water on the plants themselves uses the latent heat energy given off when water freezes. Each 1 gram of water gives off 80 calories of heat as it freezes. This helps keep the plant tissues beneath the freezing water from developing ice crystals within their cells. It is the ice crystals forming in the plant's cells that kills the cells, leading to frost damage or killing the plant. Watch the weather forecast closely so you can water your plants before the cold front arrives. Water the whole yard, not just the tender plants. The wet conditions can raise the soil temperature 5 degrees Fahrenheit above that of dry soil, and the higher temperature can remain until 6 a.m. the next morning. Wet soil also protects plant roots better than dry soil. Usually the worst freezing temperatures occur during the night, just before sunrise, so water the area you want to protect early enough before the expected cold so the water soaks deeply into the soil before temperatures start to drop. Growers use sprinkler systems to protect fruit crops from spring blossom damage or plants in warm winter areas from freezing. You can sprinkle water through an existing sprinkler system or with a garden hose outfitted with a sprinkler attachment. On nights when temperatures dip to 30 to 32 F for just a short period, a single sprinkling during the coldest part of the night may work. For cold that lasts longer, sprinkle for longer, turning the sprinklers on when it's 34 F. Once water has begun freezing on the plants, keep the water on until air temperatures are 32 F or higher and the ice has melted. For citrus (Citrus spp.) trees, the air temperature needs to reach 37 F before turning off the sprinkler. Don't run sprinklers if the sun is shining directly on the plants. Citrus trees grow in U.S. Department of Agriculture plant hardiness zones 9 through 11. Frost-tender cactuses and other succulents are an exception to the practice of watering before the cold. Succulent plants store water in their cells, and if they have abundant internal water, they are more likely to freeze. In fall when most cactuses and succulents go dormant, begin withholding water. As plants use internal water to maintain, the level of dissolved substances in the cell sap rises, creating a sort of natural antifreeze. During dormancy, water cactuses and succulents every few weeks, just for maintenance. Some succulents, especially those native to Africa and Madagascar, grow during the winter, and you shouldn't withhold water from them. Check the growing requirements for your particular plants. How Does Warm Water Affect Growing Plants?